1. Arriving by Eurostar. When your Eurostar arrives at the Gare du Nord, simply walk forwards off the end of the platform onto the main concourse and turn left, following the sign in the foreground for 'Metro & RER'. You go down the steps into the metro. 2. Follow the signs. You find your way on the metro with a line number and a 'diréction'. 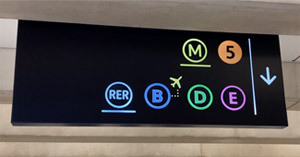 For example, from the Gare du Nord to the Gare d'Austerlitz, you'd follow the signs for metro line M5 'diréction Place d'Italie'. See the recommended metro routes further down this page. 3. Buy a metro ticket using these machines. They have a touch screen & an English language facility. 4. The metro runs every 2-3 minutes and calls at all stations. Metro line M5 links the Gare du Nord with the Gare d'Austerlitz, metro line M4 links it with the Gare Montparnasse. Metro & RER map. Taxis: Alternatively, you can take a taxi. This is the taxi rank at Paris Gare du Nord, where there's often a long queue (as you can see here) but it moves fast and you should be in a taxi within 10 minutes. Beware expensive private hire cars which also tout for business. Crossing Paris by regular taxi costs €16-€20, but is painless. Pre-book a taxi: Or you can pre-book a taxi, such as this G7 Taxi, see the taxi information. Eurostar arrives at the Gare du Nord in Paris, 10 minutes' walk from the Gare de l'Est but a metro or taxi ride from the other Paris stations. 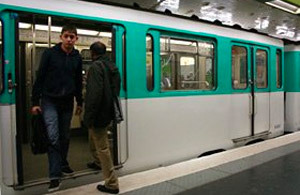 Train journeys from London to Switzerland, Italy & Spain often involve crossing Paris by metro or taxi between stations. It's easy enough, but sometimes a little daunting for first-timers. Here is a quick guide to changing trains & stations in Paris by metro, taxi or RER (Réseau Express Régional = express metro). Lunch in Paris between trains? Should you take a taxi or the metro? The metro or RER (express metro) is cheap and quick. On the other hand, a taxi is a painless way to cross Paris, especially if you have large amounts of luggage, although it costs more and actually takes a bit longer than the metro or RER. So if I'm travelling alone, I simply hop on the metro or RER, but if I'm with my wife, kids and lots of luggage, or just with my wife and it's a special occasion, I prefer a taxi. The extra cost can be a sound investment. For routes between other stations, just study the metro map. For a metro & RER map, see the Paris Metro site www.ratp.fr. click EN at the top for English, then Map. For plans of the layout of each Paris mainline station see www.gares-sncf.com. How long should you allow? (1) If your onward train leaves from the Gare de l'Est, 45 minutes between trains is sufficient as the Gare de l'Est is only a ten minute walk from the Gare du Nord. (2) If you are catching a sleeper train that you can't afford to miss, allow longer, at least 1h30 between trains for a sleeper leaving from Paris Austerlitz or Gare de Lyon. 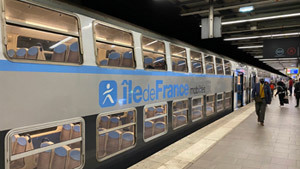 (3) If your onward train leaves from Paris Montparnasse TGV station I'd also allow longer, perhaps 70 minutes or more, as there's quite a walk from Montparnasse metro station to the Montparnasse TGV station. 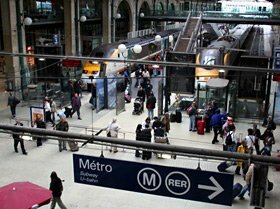 (1) If your train arrives at the Gare de l'Est, 60 minutes is sufficient between trains as it's only a 10 minute walk to the Gare du Nord. (2) If your train arrives at Paris Montparnasse, I'd allow at least 1 hour 40 minutes as it's a 10 minute walk from Montparnasse TGV station to Montparnasse metro station through the pedestrian tunnels. See summary of how long to allow. How much does the metro cost? The metro fare is €1.90 per journey. Children under 4 travel free, no ticket needed. Children under 10 travel for €0.95. It's cheaper to buy a carnet of 10 tickets for €14.50. You can keep any spare tickets and use them later, even up to a year later. Each ticket is valid for one journey in central Paris on either metro, RER (express metro) or bus. How do you buy tickets? The metro is not included in mainline tickets, so head downstairs to the metro and buy a ticket from the self-service ticket machines or at the metro ticket office. The self-service machines have an English language facility and accept euro coins, notes & credit cards. They also sell carnets of 10 tickets which can be used as and when you need them over the next year or more, by you and/or your travelling companions. Tip: The basic metro ticket you want is often shown as 't+', it's valid for one trip on the metro or RER (express metro) anywhere in central Paris. If you haven't any euros, the ticket machines will let you use a credit card even to buy just one ticket. Tip: If you are making a return journey, buy two metro tickets as you pass through Paris on your outward journey. You can use the second ticket for crossing Paris on your return trip, saving time queuing at the ticket office. Metro tickets can be used on any day once they have been bought. Tip: Keep your metro tickets away from your mobile phone, the magnetic field may corrupt the magnetic stripe so it won't work the ticket gates. Tip, buy your metro tickets on board Eurostar! You can buy Paris metro tickets for around £1.60 or €2 from the cafe-bar on board Eurostar. The small mark-up is well worth the convenience. You can also buy a carnet of 10 metro tickets for around £15.00. Unlike the London Underground, which uses a line name then northbound and southbound, Paris metro lines each have a number then a diréction. The diréction is the name of the station at the end of the line in the direction you want to go. For example, M5 diréction Place d'Italie, where Place d'Italie is the station at the end of line 5 in that direction. A taxi from the Gare du Nord to the Gare de Lyon or Gare d'Austerlitz (for example) costs around €17-€22 and takes about 25 minutes in typical weekday traffic. At the Gare du Nord, walk off the Eurostar platform onto the main concourse, turn sharp right, walk out of the station side entrance and there's the taxi rank just outside and to your right. There's often a long queue for taxis, but it moves pretty fast and you should be inside a taxi within 10 minutes. So you'll probably arrive at (for example) the Gare de Lyon by taxi 40 minutes after your train arrives at the Gare du Nord. But always allow at least an hour and preferably more between trains, see the advice above. Most importantly, never accept taxis or private hire vehicles from touts as these often turn out to be €70+. Always use the official taxi rank for a regular metered Parisian taxi. Make sure the driver turns the meter on when you drive off. All Parisian taxis should now accept credit cards as well as cash. Call the G7 Taxis English-speaking line on +33 1 41 27 66 99. Lines open 24 hours. Bookings can be made from 7 days until 1 hour before you need the taxi. You may want to call as your Eurostar approaches Paris, and you know that it's on time. A credit card guarantee may be required at certain peak times. Book the taxi for at least 10 minutes after the scheduled arrival of your Eurostar. They'll give you a booking reference. The taxi will wait up to 5 minutes if you don't turn up on time (you may be charged for the waiting time!). For some reason, their taxis can't or won't use the official station taxi ranks, so at the Gare du Nord they will normally tell you that the taxi will wait at 12, Boulevard du Denain, across the road directly opposite the front of the station. Similarly, if you're being picked up at the Gare de Lyon, ask to be picked up at number 2, Place Louis Arnand, which is outside the Hotel Mercure, just walk outside the station onto the forecourt and turn left. The taxis have a 'G7' sticker inside the rear window (see the photo to the right). Of course, you could call G7 Taxis on the day of travel using your mobile once your Eurostar exits the Channel Tunnel, and then you'll be sure you've reached France running on time. That might a good option! +33 1 41 27 66 99. You just pay the taxi driver at the end of the journey in the normal way, based on what the meter says, around €17-€22 from Gare du Nord to the Gare de Lyon, Gare de Bercy or Gare d'Austerlitz, plus the €5 booking fee. The drivers accept both cash (euro) and credit cards. A recent Gare de Lyon to Gare du Nord trip cost €25 including the booking fee and a five minute wait as we were a bit late. If you use this service, feedback would be very welcome. It's reported that they may not accept taxi bookings during the Paris rush-hour. There's a pre-bookable wheelchair-accessible taxi service in Paris run by www.g7.fr. To book, call +33 1 41 27 66 99 (English speaking line) or +33 1 47 39 00 91, making sure you ask for a wheelchair accessible taxi. There may be a €5 booking fee, and bookings can be made from 7 days until 1 hour before you need the taxi. Gare du Nord to Gare d'Austerlitz for example costs €17-€22 per taxi. If you use this service, feedback would be very welcome! A private transfer that means someone is waiting for you, holding a card with your name on it, when you walk off the platform in Paris. There's no need to spend 10 minutes in the taxi queue. A private minivan also holds up to 8 passengers, with plenty of room for luggage, most taxis are ordinary saloon cars for up to 4 passengers. On the other hand, a private transfer costs an extravagant €60+, significantly more than the €17-€22 you'd pay for a taxi. 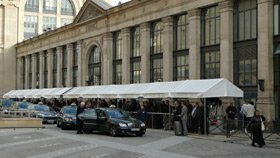 www.taxi-paris.net (+33 6 07 60 49 14, tim@taxi-paris.net) offers cross-Paris private transfers. This service gets very good reports, with an English-speaking driver meeting you at the Eurostar arrival gate with his car parked right outside the station. It costs around €60 per car plus €1 per luggage item, 4th & 5th passengers a few euro extra. They may ask for a 50% deposit. If you use this service, feedback would be very welcome. It's an easy 10 minute walk from the Gare du Nord to the Gare de l'Est, much easier than going just one stop on the metro. Walk out of the Gare du Nord onto the street in front of the station. Turn left along the front of the station, and keep going straight ahead of you up the Rue de Dunkerque until the tracks leading into the Gare de l'Est stop you going any further. Turn right into the Rue d'Alsace along the tracks, descending the long flight of pedestrian steps to the side entrance of the Gare de l'Est. This is the quickest and shortest route, but to avoid the long flight of steps, walk out of the Gare du Nord and across the road into the Boulevard de Denain straight ahead of you, turn left into the Boulevard de Magenta, then left again into the Rue du 8 Mai 1945. This route is a bit longer, but gives level access from one station to the other. Walk off the end of the Eurostar platform, turn left, and follow the signs for RER line D.
All RER line D trains stop at the Gare de Lyon, as long as you get on one going in the right direction. So follow the signs for 'RER D direction Melun / Malesherbes'. Trains may be shown as going to Melun, Malesherbes or Corbeil-Essonnes, these all stop at the Gare de Lyon. Take RER line D two stops direct to the Gare de Lyon. The train ride only takes 7 minutes. There's one stop on the way, if it's Chatelet-les-Halles you know you're on the right train! The whole trip from the Gare du Nord concourse to the Gare de Lyon concourse takes about 25 minutes including walking time, buying a ticket from the machines and waiting a few minutes for an RER train. At both the Gare du Nord and Gare de Lyon there are escalators (and/or lifts) between the mainline station concourse, the RER concourse and the RER platforms, making it relatively easy even with luggage or a pushchair. To access the RER, there are also special wide ticket gates for passengers with luggage or pushchairs. 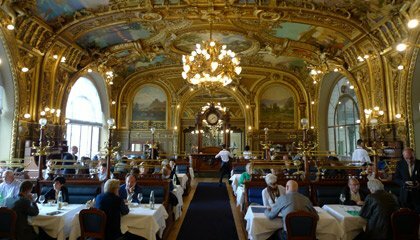 Top tip: If you've time for a meal, coffee or beer whilst waiting at the Gare de Lyon, try the famous Train Bleu restaurant on the main concourse. 2-minute step-by-step video guide: If you still find crossing Paris is daunting, see the 2-minute step-by-step video guide! Alternative by bus: If you prefer to travel on the surface by bus, no problem. It takes a while longer than the metro or RER, but costs the same. Walk out of the front of Gare du Nord – the huge ‘Brasserie Terminus Nord’ will be almost directly in front of you. Look to the left of it and you'll see a small street leading off to the right, the Rue de Saint Quentin. Head for this street and as you turn right into it, you’ll see the bus stop just ahead on the right. An electronic display will show the the minutes remaining before the next 65 is due. 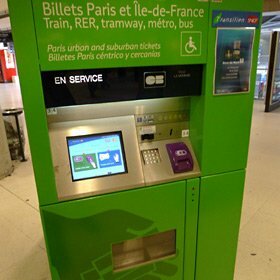 The fare is 1 metro ticket – same as on metro/RER; just push it into the machine near the driver to validate it. Keep an eye on the location indicator until the bus rounds the huge Bastille traffic circus and heads into Rue de Lyon. The station's clock tower should now be just visible out the front of the bus. Get off at the last stop in Rue de Lyon and the station will be just across the Boulevard Diderot. If you miss this stop the bus terminates just round the corner alongside the station anyway, but it’s less convenient. Walk off the end of the Eurostar platform, turn left and follow the signs for RER line D.
Take RER line D two stops from the Gare du Nord to the Gare de Lyon (follow signs 'RER D direction Melun / Malesherbes'). Trains may be shown as going to Melun, Malesherbes or Corbeil-Essonnes. Take metro line 14 one stop from Gare de Lyon to Bercy (follow signs 'M14 direction Olympiades'). Or you can walk from Gare de Lyon to Bercy, it's about 600 metres. The mainline Gare de Bercy is a stone's throw from Bercy metro station. Go up the steps to street level, then around the corner with the 'Cafe Chambertin', and you can see it ahead of you past the Hotel Claret. Walk off the Eurostar platform, veer left, and follow the signs for metro line M5. Take metro line 5 direct to the Gare d'Austerlitz (follow signs 'M5 direction Place d'Italie'). Line M5 climbs out above ground, crosses the Seine on a bridge and arrives at the Gare d'Austerlitz on a high-level station opposite the mainline station entrance. Walk off the Eurostar platform, turn left, and follow the signs for Metro line M4. Take metro line M4 direct to Montparnasse Bienvenue (follow signs 'M4 direction Mairie de Montrouge'). In contrast to other Paris mainline stations, where the metro platforms are more or less directly underneath the mainline platforms, at Montparnasse it's a 700 metre (750 yard) underground walk from the metro station to the mainline TGV platforms through broad well-lit well-signed subways, with moving walkways for the long bits, and several short flights of steps here and there. Allow plenty of time for the transfer, and if you're not good with steps or longish walks with luggage (even with the moving walkways), consider taking a taxi from Paris Nord to the Gare Montparnasse. Walk off the Eurostar platform and follow the signs for RER line E direction Haussmann Saint-Lazare. Take RER line E one stop to Saint-Lazare. It's an easy 10 minute walk from the Gare de l'Est to the Gare du Nord, far easier than taking the metro. Turn right and walk up the long flight of pedestrian steps, with the tracks into the Gare de l'Est on your right. Ignore the first left turn into the Rue des Deux Gares, but take the second left turn into Rue de Dunkerque. You'll now see the magnificent facade of the Gare du Nord straight ahead of you. This is the quickest and shortest route, but to avoid the long flight of steps, walk out of the Gare de 'Est and turn right down the Rue du 8 Mai 1945. Turn right into the Boulevard de Magenta then right again into the Boulevard de Denain. The Gare du Nord is now straight ahead of you. This route is a bit longer, but gives level access from one station to the other. Follow signs to RER 'D'. You want direction 'Creil' (sometimes shown as 'Orry la Ville') which usually means RER D platforms 2 & 4. RER D platforms 1 & 3 are for trains in the other direction. Take RER line D two stops direct to the Gare du Nord. The actual train ride only takes 7 minutes. All RER D trains call at the Gare du Nord. The whole trip from the Gare de Lyon concourse to the Gare du Nord concourse takes about 25 minutes including walking time, buying a ticket from the machines and waiting a few minutes for an RER train. At both the Gare de Lyon and Gare du Nord there are escalators (and/or lifts) between the mainline station concourse, the RER concourse and the RER platforms, making it relatively easy even with luggage or a pushchair. To access the RER platforms, there are also special wide ticket gates for passengers with luggage or pushchairs. Alternative by bus: If you prefer to travel on the surface by bus, no problem. It takes a bit longer than the metro or RER, but costs the same - one metro ticket. Head straight out the front of Gare de Lyon and there are several bus stops in the Boulevard Diderot in front of you, both to the right and left. Head to the right and use the crossing to get to the 2nd bus lane in the street and check that is the one for bus 65 – direction Mairie d’Aubervilliers. Push your ticket into the machine near the driver to validate it. Stay on the bus as it turns into Rue de Faubourg Saint Denis. After a few minutes it will cross Rue de la Fayette and then the junction of Rue de Dunkerque, then get ready to jump off. The stop is about 100 metres up Rue de Faubourg Saint Denis and you need to walk back from this stop and turn right into Rue de Dunkerque to reach the Gare du Nord's entrance. Walk out of the mainline station onto the forecourt, down the steps and across the road ahead of you. The metro station is just round the corner. Take metro line 14 from Bercy to Gare de Lyon (just one stop, follow signs 'M14 direction Saint Lazare'). Take RER line D from the Gare de Lyon to the Gare du Nord (just two stops, follow signs 'RER D direction Orry la Ville'). Alternatively, walk 600 metres to the Gare de Lyon and take the RER direct to the Gare du Nord. Take metro line 5 direct to the Gare du Nord (follow signs 'M5 direction Bobigny'). The M5 metro station at the Gare d'Austerlitz is a high-level station opposite the mainline station entrance. Line M5 crosses the Seine then dives underground for the rest of the journey. Take metro line M4 direct to the Gare du Nord (follow signs 'M4 direction Porte Clignancourt'). Note that in contrast to other Paris mainline stations where the metro is directly underneath the mainline station, at Montparnasse it's a 700 metre (750 yard) underground walk (with steps in places) from the mainline TGV platforms to the metro station, through broad well-lit well-signed subways, with moving walkways for the long bits. Allow plenty of time for this particular transfer. Follow signs 'RER E direction Tournan & Chelles Gournay'. Take RER line E one stop to Magenta, which is connected to the Gare du Nord. If you still find crossing Paris daunting, this 2-minute video will show you exactly what it's like, where to go and what to do, step-by-step. The whole journey takes as little as 25 minutes concourse-to-concourse, but always allow at least an hour between trains, preferably more. Gare de Lyon: Opened in 1903, the celebrated Train Bleu restaurant is a classic place to eat, an experience in itself and a listed national monument. It's located on the main concourse (Hall 1) at the Gare de Lyon itself. Even if you don't eat here, at least have a coffee or beer in the bar! See the Train Bleu Restaurant page for photos, info, and how to reserve a table online. Gare du Nord: Brasserie Terminus Nord, directly across the road from the station. There are other good choices, see the Gare du Nord station page. Gare de l'Est: Brasserie Flo, just inside the station's left-hand main entrance as you look at the station's classic facade. 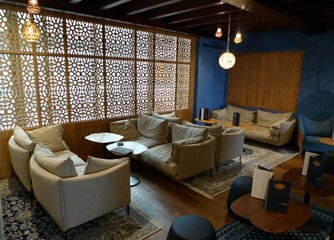 It's located in what was once the left luggage office, hence the word Consigne in the stonework directly above the bar. The wonderful Train Bleu restaurant (above right) and its Big Ben bar (above left) at Paris Gare de Lyon. See the Train Bleu page for details. Here is a summary of how long to allow to make connections across Paris. The minimum connection times shown here are the minimum amount of time you should allow between the scheduled arrival of your train in Paris and the scheduled departure time of your connecting train from Paris. At least 45 minutes, maybe longer if catching the last train of the day. At least 60 minutes, maybe longer if catching the last train of the day. 90 minutes perhaps, if catching the last train of the day or a long-distance sleeper train which you cannot afford to miss. 60 minutes minimum, which includes the compulsory 30-minute Eurostar check-in time. if you miss the Eurostar because your train is significantly late, the Eurostar staff should let you catch the next one, assuming seats are available. 1 hour 30 minutes minimum, which includes the compulsory 30-minute Eurostar check-in time. if you miss the Eurostar because your train is significantly late, the Eurostar staff should let you catch the next one, assuming seats are available. Since the opening of the new UK high speed line in 2007, around 90% of Eurostars normally arrive within 15 minutes of the advertised time, but it is not unknown for problems in the Channel Tunnel to delay a Eurostar by an hour. If you're connecting with (say) a long distance sleeper train which you can't afford to miss, then better safe than sorry! What to do if you miss a connection.